Often noted as the only treatable form of cancer, as it can be diagnosed early, cervical cancer is rapidly claiming the lives of thousands of women globally. In 2017, The World Health Organization (WHO) reported an alarming number of 14,089 women suffering from cervical cancer annually, thus making it the second leading cause of cancer death. 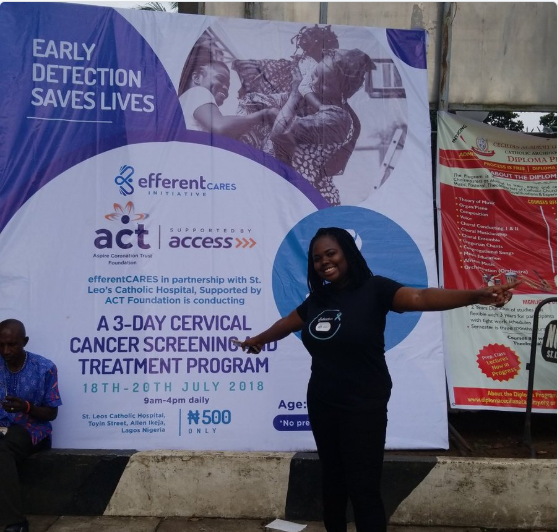 Silent but deadly, cervical cancer is a slow growing disease that rarely shows symptoms in its early stages, hence to nip this in the bud, ACT Foundation partnered with Efferent cares to create awareness as well as provide screening for women in the Ikeja, metropolis of Lagos state. Efferent cares Ikeja cervical cancer screening which was done in partnership with St. Leo’s Catholic hospital, saw the campaign sensitize women as well as screen them for cervical cancer. Hundreds of women around the vicinity were educated on how to safeguard their health and reduce their chances of cervical cancer. The screening which made use of “Enhanced Visual Assessment (EVA) System” aided visualization for the women as well as enabled appropriate recording and correct diagnosis. The most unique aspect of the Ikeja cervical screening entails the partnership with St Leo’s Catholic hospital which will house the EVA System for continually use in the hospital for the screening of women for cervical cancer. Efferent Cares Initiative will also be visiting the Mushin area of Lagos state for the cervical cancer awareness campaign.